Your yard is a space where you relax with your family and entertain friends; your kids and pets may play in the lawn spaces and its why these spaces have to be well-designed. Every homeowner has specific ideas about what they want these outdoor areas to look like and we go out of our way to provide custom landscape design solutions to our clients. We at Mother Nature Landscaping are a full service company that has handled a number of small and large scale outdoor design and install projects for customers in and around Bloomington, Martinsville, Mooresville, Bedford and Columbus. Over the years we have also catered to customers across Franklin, Seymour, Greencastle, Greenwood, Plainfield as well as Beech Grove. With over a decade and half of experience behind us, we have built the expertise to design alfresco areas that will be functional and attractive all at once. Outdoor Kitchens - Most homeowners like to have an outdoor kitchen in their yard. It’s a great setting for BBQ parties and you can also spend relaxed moments there with your family and friends. 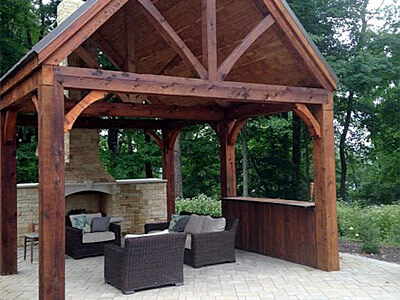 We provide custom outdoor kitchen plans based on your specific needs. The kitchen can be paved with a material of your choice and you can have the type of kitchen counter you like. We will ensure there are properly-allocated spaces for all your appliances and that there is plenty of storage. Fireplaces and Fire Pits - These installations are almost a part and parcel of any residential outdoor space and we can provide custom fireplace design that will blend in with the rest of the features in the space. Since we will be designing the fireplace or fire pit, you can choose the size, shape, style and materials to be used in the feature. These fire features can be installed in any part of your yard or on your deck or patio. Decks and Patios - Most homeowners like to get either a deck or patio installation. The custom patio design we provide will be right in line with your requirements and you can choose between natural stone, brick or stone paving. If you like we can also install larger paver stones made of travertine, slate, bluestone, flagstone etc. in the design and style you want. When we build timber decking we ensure that the best hardwoods are used in the work and that the craftsmanship is top of the line. If you prefer a composite deck, we can build that too. Aside from this, we also design and handle installation of water features, pergolas, gazebos, garden a benches, water features and outdoor lighting to complete the look of these outdoor spaces. If you looking for experienced &reliable outdoor living designers, you need look no further than our company. You can discuss your project details with the specialists at Mother Nature Landscaping and we will provide solutions at very reasonable landscape design cost. The number to call is - 812-339-5296. You can also contact us via this online form or request for a free consultation and quote via this form.